Dozens of protesters gathered in Detroit to protest the unveiling ceremony of a controversial bronze Baphomet statue by the Satanic Temple. 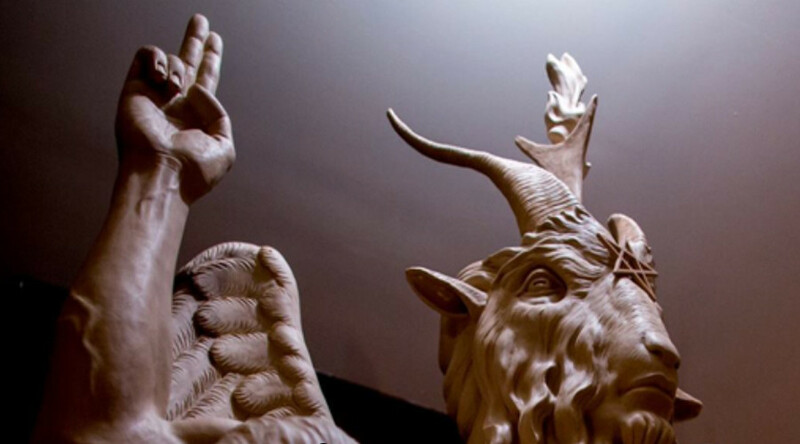 When the one-ton goat-headed statue was finally exposed, supporters welcomed it, and cheered "Hail Satan!" "The last thing we need in Detroit is having a welcome home party for evil," Reverend Dave Bullock, a pastor at Greater St. Matthew Baptist Church in Highland Park, Michigan told Reuters. Satanists want to build a satanic church in Detroit with the statue of the Baphomet... but Christians wanna stop them. Hypocrites. Temple spokesman, Lucien Greaves, explained in a statement earlier this year that the monument would serve "as a beacon calling for compassion and empathy among all living creatures." He added that it will also have a certain "functional purpose" – as a chair where "people of all ages may sit on the lap of Satan for inspiration and contemplation." The director of the Satanic Temple Detroit chapter, Jex Blackmore, said group members planned to transport the sculpture to Arkansas. In April, Arkansas Governor Asa Hutchinson signed into law a bill instructing the state to erect a privately funded Ten Commandments monument on the State Capitol's grounds.